Patti Yasutake, who has gone to distant worlds as a cast member of “Star Trek: The Next Generation,” is now traveling back in time to Louisiana in 1987 — and she is thoroughly enjoying the trip. 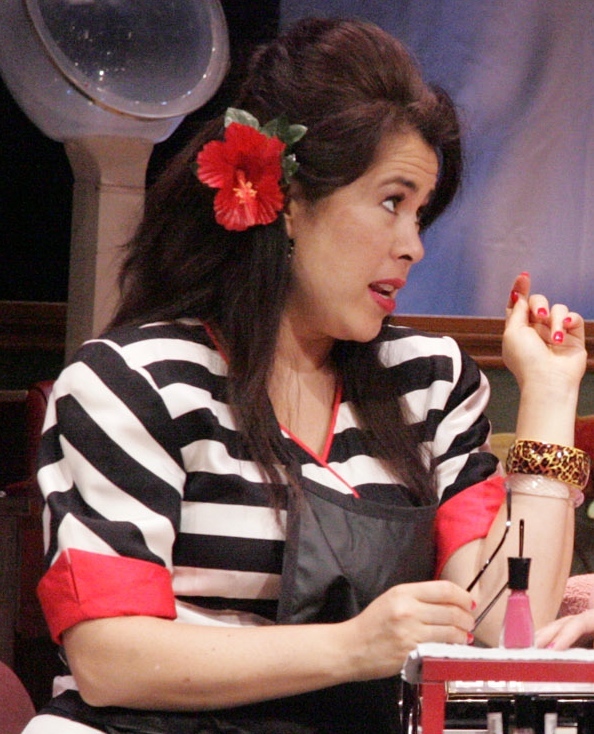 She is part of the all-Asian cast of Robert Harling’s “Steel Magnolias,” now playing at East West Players in Little Tokyo until Oct. 6. The play is set at Truvy’s Beauty Salon in Chinquapin, La., where we learn of six women’s trials and tribulations over the course of nearly three years. One of the conflicts is between Yasutake’s character, M’Lynn, and her daughter Shelby, who wants to have a baby even though her medical condition would make childbirth life-threatening. The 1989 movie based on the play earned an Oscar nomination and a Golden Globe for Julia Roberts (as Shelby) and a Golden Globe nomination for Sally Field (as M’Lynn). A 2012 made-for-TV remake, set in the present with an all-African American cast, featured Queen Latifah as M’Lynn and Condola Rashad as Shelby. In the play, unlike the films, the husbands and boyfriends are mentioned but never seen, Yasutake notes. 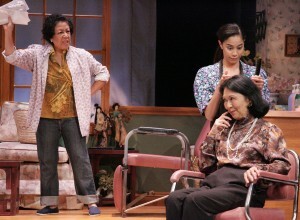 “The beauty of the play is that all scenes occur only in the beauty shop. So the live audience is invited into these women’s clubhouse or sanctuary and can experience inclusion in that privacy first-hand. And when it’s played in 1987, the need for that safe haven is all the more significant, since ‘outside,’ race and gender roles were more oppressive back then. 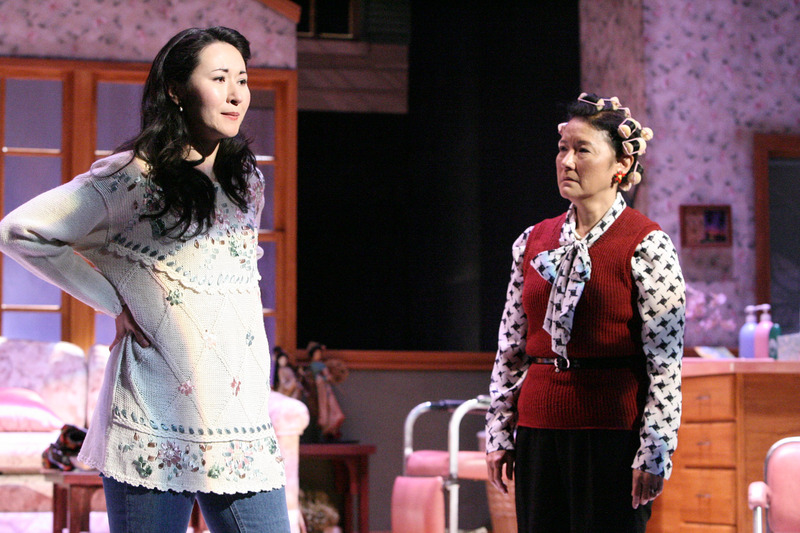 Yasutake emphasizes that the EWP production is not an example of non-traditional casting — casting people of color in classic plays, from Shakespeare to “The Sound of Music” — because Asian Americans have been living in the South for a long time. Hiwa Bourne (Truvy), who teaches Hawaiian and Tahitian dance, is the daughter of a Caucasian mother from Alabama and a Hawaiian/Chinese father. “Hiwa’s warm Hawaiian hospitality perfectly suits Truvy’s quality to make her client feel right at home,” Yasutake says. Minor changes were submitted to the playwright’s attorneys, but Harling was not available to give approval due to the death of his mother, who was the inspiration for M’Lynn. “Some changes submitted included Clairee’s last name being Matsu instead of Marmillion, and besides bringing her ‘annual pecan tassies’ she brings maki-zushi,” Yasutake recalls. 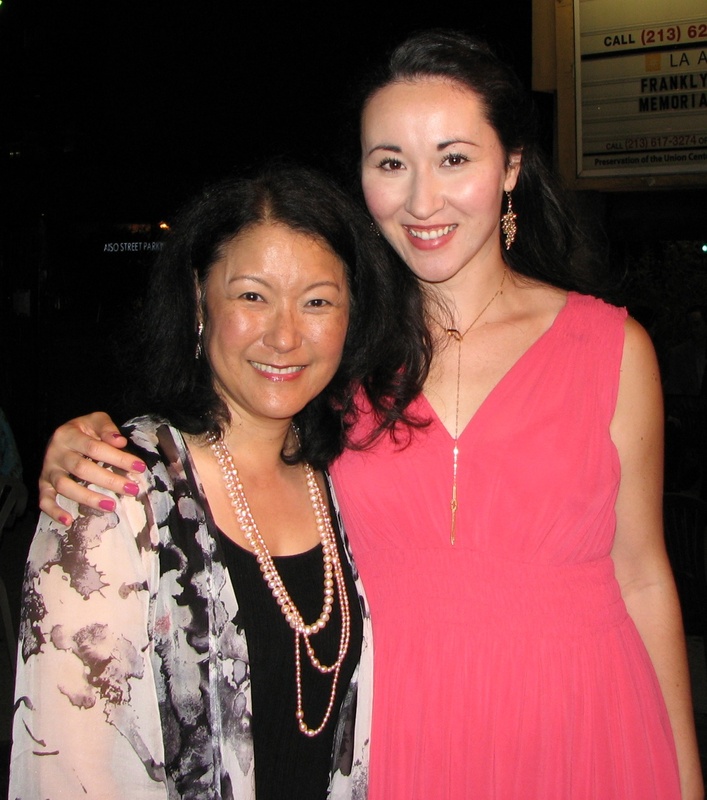 “Dian Kobayashi, who plays Clairee, is Japanese American and brings a JA sense of reserve and decorum, yet coupled with an easy-going Hawaiian charm and wit, which is classic Clairee. “Although words could not be changed, there are also design references. Hiwa Bourne … enjoys her Truvy wearing flowers in her hair, plus she made the ti-leaf lei hanging in her shop. There are other set decorations that suggest culturally influenced gifts the women would have given her, such as Japanese dolls and maneki neko. Some clothes suggest culture, such as my aloha-type camp shirts or the Chinese jewelry worn by Ouiser, whom Karen Huie plays as a Chinese self-made immigrant. Yasutake credits director Laurie Woolery, who is making her EWP debut, for putting the cast together. “Not knowing anyone’s personal or cultural background, she cast perceptively with our essences and personalities to immediately suit the characters and their relationships. Then we found all our individual cultural heritages perfectly supported each of our characters being of that particular heritage. 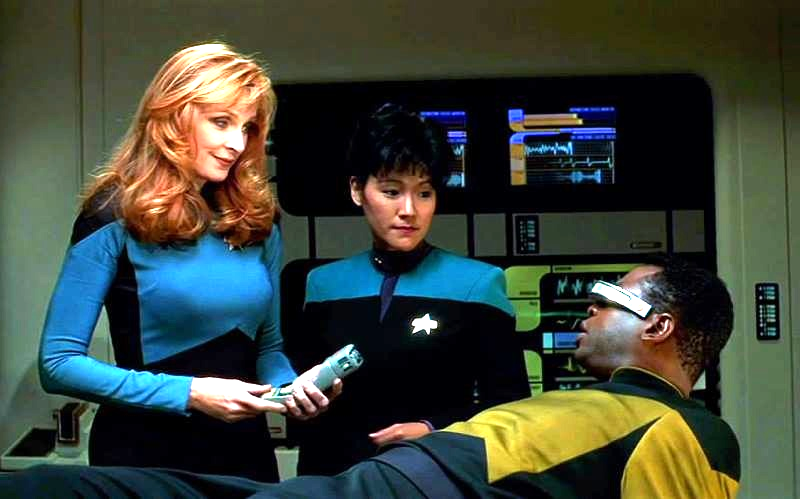 Patti Yasutake played Nurse Alyssa Ogawa in “Star Trek: The Next Generation.” She is pictured with Gates McFadden as Dr. Crusher and LeVar Burton as Geordi La Forge. 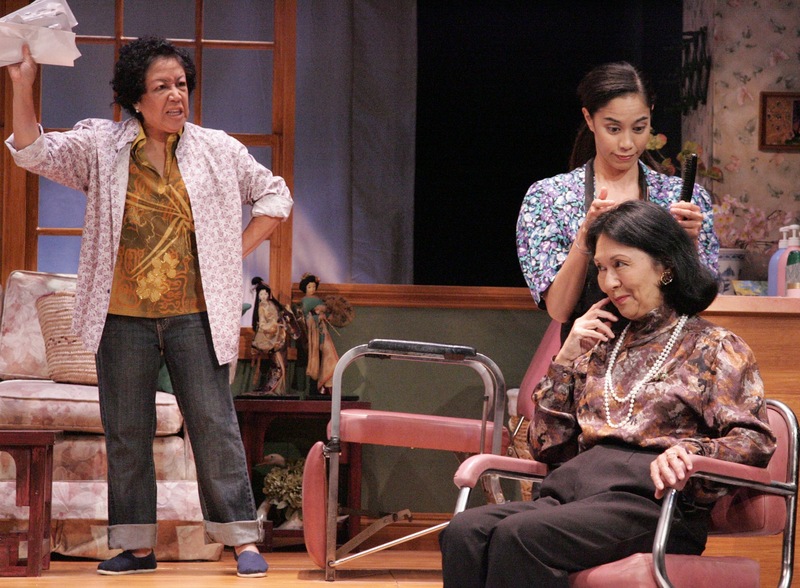 Her involvement with “Steel Magnolias” is a homecoming of sorts — she worked at EWP with the late actor and artistic director Mako for six years. Yasutake is among the EWP alumni who have made their mark on the big and small screens, including John Cho, Kal Penn, Daniel Dae Kim, Masi Oka, Amy Hill and Tamlyn Tomita. If she gets recognized in public, it is usually for her role as Nurse Alyssa Ogawa in “Star Trek: The Next Generation.” She appeared in 16 episodes, including the series finale in 1994, and in two movies, “Star Trek: Generations” and “Star Trek: First Contact.” Like other cast members, she is often invited to conventions. “Last year I did the huge Las Vegas convention, which I usually do every other year,” Yasutake says. “This year I attended FedCon in Germany, the biggest in Europe, which was great fun. I met a promoter from England there, who wanted me at their event, so we’ll see. I’m not on the convention circuit … I do something annually or every other year. A 2007 episode of “Cold Case” titled “Family 8108” was “the most special,” Yasutake says, “because rarely does prime-time network TV focus on our personal experiences, let alone our Japanese American history. It was great playing a daughter who personally needs to find out why her mother is shut down, then uncovers the emotional effects of their internment camp history.” The cast also included Kim Miyori, Ian Anthony Dale, Keone Young, David Huynh, Ron Yuan and Mia Korf. In an episode of “NCIS: Los Angeles” that aired Tuesday, Yasutake played NTSB Chief Howard. The director was her former co-star Jonathan Frakes, who played Commander Riker on “Next Generation.” “It was delightful to work with him again, plus Chris O’Donnell and everyone there was super nice,” she says. The episode can be viewed online at www.cbs.com. At East West Players, Patti Yasutake (who was in her 20s) and Clyde Kusatsu played an elderly couple in Philip Kan Gotanda’s “The Avocado Kid.” Kusatsu later had a recurring role as Adm. Nakamura on “Star Trek: The Next Generation.” Yasutake and Kusatsu both appeared in the show’s final episode, but not in the same scenes. Yasutake and Gedde Watanabe played Umeki and Kaz Kazuhiro in the 1986-87 sitcom “Gung Ho,” starring Scott Bakula (Capt. Archer on “Star Trek: Enterprise”). The sitcom was based on the 1986 movie of the same name about a Japanese car company taking over an American plant. The movie starred Michael Keaton and featured Yasutake, Watanabe, Sab Shimono and Rodney Kageyama in supporting roles. Shimono and Kageyama also appeared in the TV series. In 1991, Yasutake appeared in the TV movie “Fatal Friendship” with Kate Mulgrew (Capt. 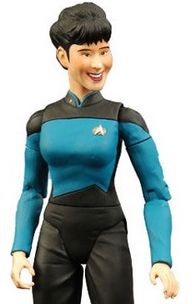 Janeway on “Star Trek: Voyager”). Also, Yasutake and Robert Beltran (Commander Chakotay on “Voyager”) portrayed a couple in Luis Valdez’s play “I Don’t Have to Show You No Stinking Badges” at the Los Angeles Theatre Center in 1986.